The beginning of October was the perfect time to visit Umbria, as the sun was gentle and the leaves were just turning red and gold. As we meandered through the hill-top towns and villages we were able to enjoy the wonderful sights of ancient fortified towns such as as Spoleto, Spello and Montefalco. 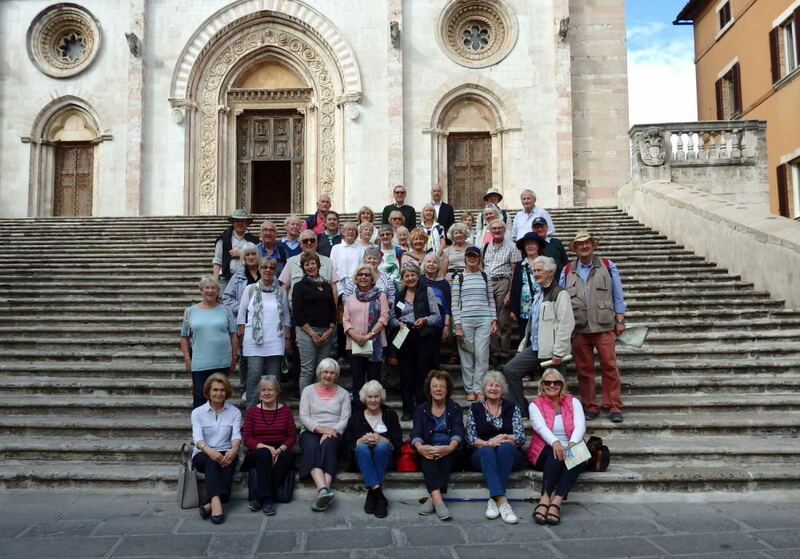 The cleverly-constructed escalator at Perugia saved us an up-hill climb to the magnificent Galleria Nazionale and we thoroughly enjoyed our guided tour of the Basilica in Assisi taking in the stunning frescoes of Giotto. In bustling, delightful Urbino we visited the Casa Natale di Raffaello and the Palazzo Ducale. Throughout Umbria we were treated to delicious food and wine wherever we went. It was a most enjoyable tour. The exhibition featured artefacts selected from 13 archaeological institutes and museums in Shaanxi Province. While the highlight was undoubtedly the sensational life-sized terracotta figures with their individual facial features and distinctive clothing, the exhibition also included many exquisite gold, silver, bronze, ceramic, and jade objects. All the exhibits were accompanied by clear explanations of how the Qin Dynasty developed from a small fiefdom into a vast empire. With time at leisure many members chose to explore the outstanding architecture in the vicinity of the World Museum. Some enjoyed Liverpool Central Library and in particular the beautiful Picton Reading Room. The world-class Walker Art Gallery with its outstanding collection of Pre-Raphaelite paintings, was another popular destination as well as nearby St George’s Hall, regarded as one of the finest Neoclassical buildings in the world. Our summer day visit took place on Thursday 7 June. Thanks to Lewis, our driver, we enjoyed a smooth and comfortable ride through the leafy countryside to Appleton Manor in Oxfordshire to be greeted at the gate by the owner, Alison Jeffreys, accompanied by her Head Gardener Nathan and his two assistants. After coffee and home made cake overlooking the house, which is Norman in origin with Arts and Crafts additions, we enjoyed a tour of this stunning contemporary garden which its owner described as ‘a work in progress’. After a relaxed stop for lunch at the nearby Greyhound pub we drove to Rousham Park to enjoy a guided tour of this extraordinary house, filled with treasures collected over the centuries by the predecessors of the resident Cottrell-Dormer family and retaining many architectural features and furniture introduced by William Kent. Before returning to Stratford we had the opportunity to enjoy the mature gardens, its cascades of scented roses and rampaging foxgloves as well as Kent’s stunning vistas punctuated with classical sculpture. This was a day of complete contrast, with both the contemporary and the historic garden offering a host of pleasurable surprises. Sunshine and blue skies followed us on our trip to Berlin and Dresden in May. After spending three days learning about the newly-revived Berlin post-reunification, marvelling at the Reichstag and the treasures in various museums on Museum Island, we spent a very pleasant day in Potsdam, where we visited the Cecilienhof where the Potsdam Treaty was signed on behalf of the Allies in 1945 and later on in the afternoon, the delightful Sanssouci Palace. We then travelled on to beautiful Dresden, where we really enjoyed the Frauenkirche and surrounding buildings, destroyed in World War 2 and reconstructed only at the end of the 1980’s with the help of donations from all over the world. The Old Masters Picture Gallery in the Zwinger Palace as well as a wonderful Meissen porcelain gallery were also greatly admired. Our last day was spent visiting the Meissen Porcelain Museum, where members of our group marvelled at the skill of some of the specialist factory workers. The journey down to London started promptly and despite the usual congestion there was nearly an hour of free time before lunch. 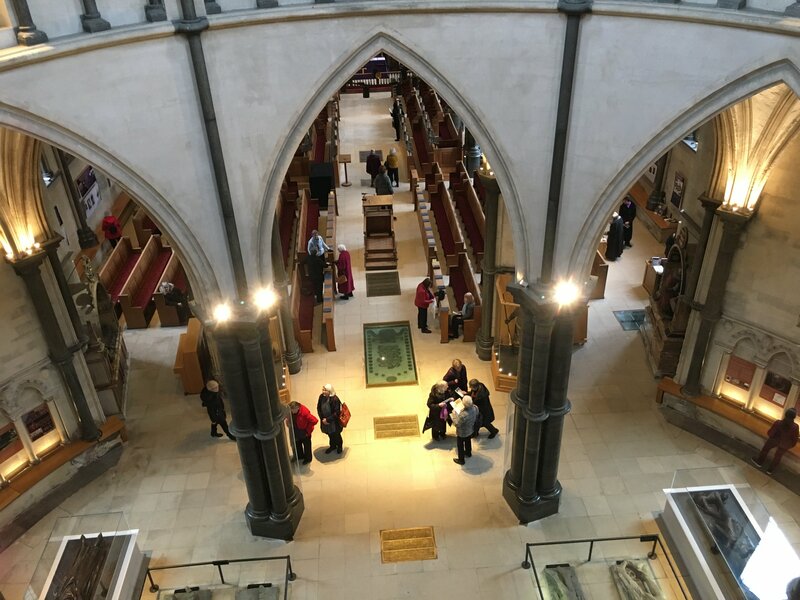 This provided an opportunity to visit the historic Temple Church, built by the Knights Templar, who protected pilgrims to the Holy Land during the Crusades. Modelled on the circular shape of the Holy Sepulchre in Jerusalem, the church houses an interesting collection of effigies, some of which are alleged to be early Templars. There was also a moving exhibition on the First World War. Lunch was enjoyed in Middle Temple Hall with its spectacular Elizabethan double hammer beam roof and elaborately carved screen and balcony. Our group, seated at four enormous tables, was served a set lunch while the surrounding judges, barristers and their pupils collected their meals from the buffet. After lunch it was a short walk to Two Temple Place for both a tour of the building and to see the current exhibition. Built between 1892 and 1895 by John Loughborough for William Waldorf Astor at a cost of £25,000 (around £25 million in today’s prices) the house features fine wood carvings. They include statues representing characters from literature, one of Astor’s passions. The building’s own Great Hall was influenced by that at Middle Temple, and is completed by a fine hammer beam roof. After a slow start leaving Stratford the event began in the Wedgwood restaurant with refreshments followed by an excellent lecture from the Curator, Gaye Blake-Roberts. She talked about the early history of the Wedgwood owners and product range weaving in the influence of different artists over the two centuries of the organisation’s history. We were split into two smaller groups for the next two organised activities. Lucy Lead, the archivist, pointed out some of the most interesting items in the museum. 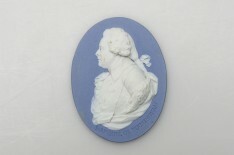 The other group was guided by Rebecca Klarner in the best way to handle a variety of Wedgwood products. These ranged from simple plates to a very elaborate and fragile looking £5,000 fruit bowl. After a well organised and professional morning we ate together in the restaurant. Our wonderful trip to Sicily was accompanied by wall-to-wall sunshine and blue skies for the duration of our stay. On our first morning we marvelled at the beautifully preserved mosaics at Piazza Armerina and in the afternoon our charming arqueo-anthropologist guide brought the whole Valley of Temples to life. Our journey from the South to the North of the island in order to reach Palermo was not at all tedious, as the coastal and countryside scenery was simply stunning. 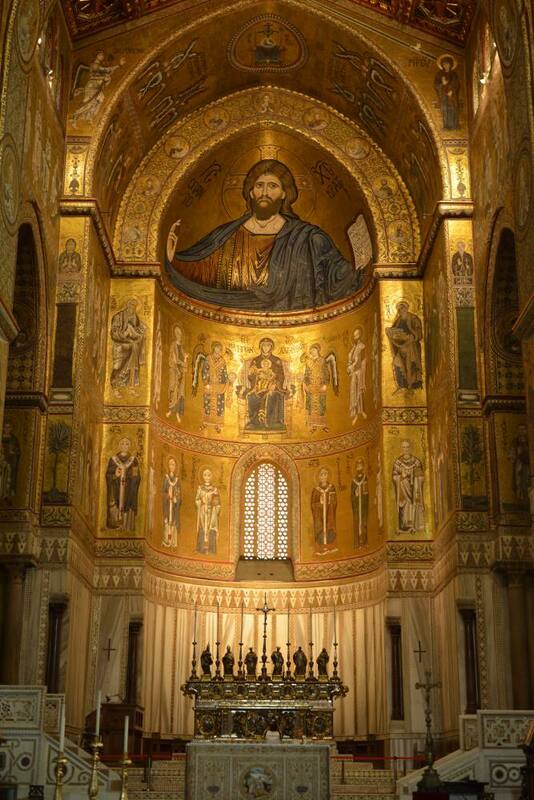 A good night’s rest and a substantial breakfast, including home-made Sicilian delicacies, set us up for our guided tour of the city and Monreale and the Palatine chapel. The next day the weather was perfect for our stop in the pretty medieval seaside town of Cefalú. After meandering through the quaint streets we were given some welcome free time. Some members of our group chose to enjoy a leisurely lunch in one of the many beach-side restaurants, whilst others took advantage of the warm sea and sandy beach to have a swim. Our last 3 nights were based in a lovely hotel in the seaside resort of Giardini Naxos. In the morning we were offered the optional tour of travelling by cable car to reach the summit of Mt.Etna or the chance to relax by the beautiful hotel swimming pool or to stroll along the seafront before an afternoon visit to the pretty town of Taormina, where, in the sizzling afternoon heat, we were introduced to the Duomo and the 4th century BC Greek amphitheatre. Our last day was spent in Syracuse, the most important and powerful Greek city from the 5th to the 3rd centuries and home to the Temple of Apollo. We were impressed by the Parco Archeologico, which featured the Teatro Romano and the spectacular Teatro Greco. A most pleasant surprise was the delightful island of Ortigia in the historical heart of the town, where enchanting little houses and Baroque buildings lead to the impressive Piazza Duomo, where we were spoilt for choice for photo opportunities and elegant cafés. We were somewhat reluctant to leave this idyllic place and its charming fish restaurants on the water-side but we were expected for lunch at a farmhouse some 30 minutes from Syracuse. It did not disappoint as we were served delicious cheese and salami as antipasti, followed by home-made pasta with wild fennel and mini aubergine parcels, all washed down with lovely Sicilian wine. The highlight of our trip (there is ALWAYS a highlight on our Stradfas tours!) was perhaps the appearance of the owner of the farmhouse, “il Barone”. In impeccable English, he exchanged pleasantries and then nonchalantly mentioned that he was also the owner of the Palace in the Piazza Duomo in Syracuse and that we were welcome to stop by for a café anytime we chanced to be there. A memorable trip, which left us all wanting to return to visit more of this magnificent island, and of course, il Barone! Our visit to Buckingham Palace took place in glorious sunshine on the last Sunday in September. Thankfully everyone was in time for the coach which enabled Mark, our Johnsons’ driver, to make a prompt start. This ensured that we arrived in London in time for the first group of members to embark on their timed visit to the Queen’s Gallery at 11 am. Canaletto and the Art of Venice told the story of Canaletto’s superb paintings, drawings and prints of Venice which are now in the Royal Collection. It explained how they were bought by the young George III in 1762 from Canaletto’s agent and dealer Joseph Smith, British Consul in Venice, along with the rest of Smith’s huge collection. Canaletto’s detailed sketches were truly mesmerising, filled with a wealth of architectural detail as well as charming depictions of contemporary people and their animals. The exhibition revealed how the painter eschewed accurate representations of buildings and perspective in order to achieve a more attractive composition. to include a visit to the Royal Mews where they admired grey and bay carriage horses and the extraordinary carriages which they pull on ceremonial occasions. One of the most fascinating was the Diamond Jubilee State Coach first used in 2014. It successfully combines traditional craftsmanship and modern technology with an aluminium body and six hydraulic stabilisers. The gilded crown on the top of the coach, carved from oak from HMS Victory, can hold a camera to film the crowds lining the route. Finally everyone enjoyed a tour of the State Rooms of Buckingham Palace with its special exhibition telling the story of the Queen’s reign through a display of official gifts presented during the past 65 years. The variety of gifts on display was mind-boggling. Without doubt their donors gave a great deal of thought to their choice of gift and the results included such tributes as woven baskets made from banana leaf, a model of the Queen’s horse, Burmese, and a brightly coloured model truck painted with portraits of the Queen and Prince Philip. A special display in the Music Room paid tribute to Diana, Princess of Wales on the 20th anniversary of her death, with items including her desk and brief case selected by her sons for the occasion. After enjoying afternoon tea in the Garden Café, with its views of the palace gardens, and the chance to purchase souvenirs from the Palace Shop, we made our way round the garden to the exit to be reunited with Mark and our coach for the journey home. We meet at our designated pick up points and transfer by coach to Luton Airport for our direct scheduled Easyjet flight to Vienna. On arrival in Vienna we are met by our guide and transfer in our private executive coach to the 4* Savoyen Hotel for a four night stay. Set three course dinners without drinks are included in our hotel on the first and last evenings, and the remaining two nights are on bed and breakfast basis. This morning we depart with our guide and coach for a city tour of Vienna, taking in the imperial and architectural beauty of the city, a reminder of the great wealth of the Hapsburgs and the splendour of the Austro-Hungarian Empire. During our guided tour we visit St Stephen’s Cathedral, dating back to 1147 and for a long time uncontested as the tallest building in Europe. After free time for lunch in Vienna we visit Schönbrunn Palace, commissioned in 1696 by Leopold I, completed in 1730, and adapted in the mid 18th century for Maria Theresa. Our audio-guided tour takes in her bedroom, hung with Brussels tapestries, her breakfast room decorated with needlework worked by her and her daughters, and the Hall of Mand magical scenery. The famous Benedictine Melk Abbey is our destination, offering one of Europe’s finest examples of Baroque architecture. Time is then at leisure for lunch in Melk which dates back to 831 and offers a wonderful variety of architectural gems. We then return to Vienna where the rest of the day is at leisure. This morning we visit the Imperial Apartments at The Hofburg, the residence of the Hapsburgs for over 600 years. The Hofburg was considered the centre of the Hapsburg Empire and during our audio tour we visit the authentically furnished Imperial Apartments, the Sisi Museum and the Silver Collection, home to a fine and extensive collection of Imperial utilitarian objects. We enjoy a guided tour at the Kunsthistorisches Museum this afternoon. The 16th century Kunst-und Wunderkammer (art and treasure chambers) of Archduke Ferdinand and of Empirrors, where Mozart, aged 6, gave his first recital. The gardens were laid out with fountains and statues, and later, on the Gloriette Hill, a colonnaded arcade was added, from which one has an extensive view over the city. This morning we explore the UNESCO listed Danube Valley with its rich historyeror Rudolph ll, together with the Baroque collections of Archduke Leopold Wilhelm, forms the nucleus of the Museum’s magnificent collections. We enjoy a farewell dinner in our hotel this evening. We visit Upper Belvedere Palace this morning, and our guided tour on arrival introduces us to a fine collection of Austrian art dating from the Middle Ages to the present day, including the world’s largest Gustav Klimt collection. We then transfer to the airport for our direct scheduled Easyjet flight to Luton, and onwards coach travel back to our original pick up points. NB: Please note we reserve the right to alter the above itinerary if required for operational reasons. Given the historic nature of the places visited, a certain degree of walking will be involved, and this holiday may not be suitable for those with mobility problems. We enjoyed good weather for our trip with just a little abnormal traffic as we reached London. A private tour of the very stylish Stuart Ham House enabled small groups to enjoy the enthusiasm and anecdotes of the guides. There was a glimpse of a fine collection of paintings, textiles and furniture. Outside the garden was a contrast between the rectangular vegetable gardens and flower gardens near the Orangery, the radiating structure of the less formal ‘wilderness’ gardens and the formal parterre gardens. Just over the river was our second destination, Strawberry Hill House. This brilliant white gothic revival villa, built by Horace Walpole in the second half of the eighteenth century, provided a distinct contrast in style with Ham House. Although Walpole built up an impressive collection to fill his house, subsequent beneficiaries got into debt and in 1842 the entire collection was sold off. Despite this the magnificent architectural details such as the Robert Adam fireplaces, stained glass, fanned ceilings and wallpapers can still be admired, recently restored with impressive scarlet and gold details. The exhibition brought together an extensive selection of David Hockney’s most famous works celebrating his achievements in painting, drawing, print, photography and video across six decades. Seated in a very comfortable smart lecture theatre we were delighted by our Tate lecturer guide, he gave us an insight into Hockneys private life and his work through the decades. As a young man Hockney featured in the exhibition ‘Young Contemporaries’ that announced the arrival of British Pop Art. Openly gay he explored the nature of gay love in his portraiture. The lecturer had talked about a period in David’s life his paintings reflecting his life style at that time . Never one to stand still Hockney began to produce photo collages called ‘joiners’ (polaroid snaps of a single subject). He also used the “ Quantel Paint Box “ a computer programme that allowed the artist to sketch directly onto the screen. He painted hundreds of portraits, still life and landscapes using the brushes iPhone and iPad application. David Hockney’s largest paintings ‘The Bigger Trees’ measure 15ft by 40ft, they were truly magnificent. Passing through the rooms of the exhibition, (which had been put together by David Hockney) was a wave of changing emotion, a life time of achievement. One in which we were lucky to see. Following the Capability Brown Special Interest Day on 11 October, we visited one of his well known creations at Chatsworth for our 2016 Christmas outing. Chatsworth House was decorated for Christmas, with access to the magnificent house with its extensive art collection and to the garden which is famous for its rich history, historic and modern waterworks and sculptures. The ever popular Tim Bridges showed us the delights of several churches in the Forest of Dean area. Tim once again guided us round some fascinating churches and opened our eyes to features we might otherwise have missed. As always on these trips, there there was a stop for lunch at a local hostelry. June 20 had dawned rather grey and wet but this did nothing to dampen our spirits as we set off for Hampton Court Palace. We had arranged for two Blue Badge Guides, Jennifer and Wendy, to meet us there. These two were well known to us as they had previously guided us superbly round St Pauls Cathedral and they didn’t disappoint this time. In the morning they showed us around the Tudor apartments where Henry VIII held sway. We saw the Royal Chapel with its beautiful starry ceiling and the Great Hall with its magnificent hammer-beam roof and huge tapestries where once hundreds would have dined. We then visited the extensive Tudor kitchens where their meals would have been prepared. We learned that the numerous pies we saw were simply disposable containers for their meaty contents- rather like MacDonald wrappers. After lunch the sun came out for our guides to show us around the gardens which had undergone several reincarnations. Amongst themany interesting parts, we were shown the sunken garden, originally a fishpond, to provide for the kitchens, and the largest grape vine in the world. Our guides then took us round the William and Mary apartments including the marvellous Guard Room artistically hung with hundreds of different weapons and the series of connecting rooms leading to the innermost private Royal quarters. We had a very enjoyable visit to Hampton Court, a day full of spectacle and interest AND we didn’t lose anyone in the maze! – a major exhibition exploring the ways artists and designers from Pre-Raphaelites to the present day responded to Sandro Botticelli. The exhibition included paintings, fashion drawings, tapestry, sculpture & print, alongside works by artists such as Dante, Rossetti, William Morris, Andy Warhol to name but a few, and we were left in no doubt that Botticelli had indeed influenced many great artists in many different ways. The visit to the magnificent Windsor Castle in December was wonderful, showcasing some of the finest treasures from the Royal Collection, paintings by Old Masters and the spectacular private apartments created for George IV. St George’s Chapel, set within the Castle Precincts, where ten monarchs are buried including Henry VIII & Charles I, was a fitting finale. We visited Kelmscott Manor, the delightful former country home of William Morris and his family. The house contained a collection of the possessions and works of Morris and his associates including furniture, familiar textile designs and ceramics. After lunch we took a short ride to nearby Buscot Park, the family home of Lord Faringdon who looks after the property on behalf of the National Trust. There we viewed the magnificent house and grounds which include one of Britain’s finest water gardens. Our first stop in Oxford was the Ashmolean Museum. At our September Study Day, Lucia Gahlin will be our lecturer on Egyptian Art and Architecture, and she provided notes for our visit to the Ashmolean so that we could view some of the artifacts that she will be describing in her talks. As well as the many other wonderful exhibits we could view, there was also an exhibition of Great British Drawings which some members visited. Lunch was just across the road at Trinity College. We mingled with the few students who were still around and who were dressed in “subfusc”, (dark suits and bow ties for the men, smart white shirts and back ribbons for the girls, plus gowns of course) the obligatory wear when sitting examinations. A short coach ride took us to the Botanic Gardens where two excellent guides enabled us to appreciate and enjoy the many fascinating plants in the greenhouses and gardens. We were lucky to have fine weather which ensured a successful conclusion to our day. This followed the February lecture, The Day Parliament Burned Down. Our trip to Parliament & Westminster Abbey was far from uneventful. Travelling through London is never easy, but we hadn’t reckoned on the President of Mexico making an unofficial visit. He brought traffic to a standstill, whilst the security services closed Westminster Abbey. Many anxious moments passed before we arrived at The Palace of Westminster, to be frisked and then guided through the most magnificent architectural halls and rooms, filled with sculptures of the Kings & Queens of England. There were pictures in the long gallery depicting the great wars, and the Lords Debating Chamber was just steeped in history. Our tour of Parliament was quite fascinating and over far too soon. We had lunch at The Wesley Cafe in Central Hall, and we were joined by Jennifer, our Blue Badge Guide. Jennifer was to come with us to our changed venue of St. Paul’s Cathedral. During the long journey there she filled our time brilliantly by treating us to an amusing history of the buildings and streets, as we travelled to Ludgate Hill to see St Paul’s, on the highest point in the City of London. The commentary we had from her inside St. Paul’s was exemplary, using headphones (which meant we could hear her above the organ, which started up!). St Paul’s is of course a wonderful Cathedral, and the burial place of the great & the good, with Wren’s architecture only to be wondered at. In spite of the many hurdles put in our way, it was generally agreed that it was an excellent day, perhaps to be repeated in the future. ‘The Nutcracker’: Birmingham Royal Ballet at the Birmingham Hippodrome. We visited the traditional ballet performance of the Nutcracker for a matinee performance on our pre-Christmas day out. The day was lead by Tim Bridges, who has guided us round a number of churches in the Midlands. On October 14 he showed us some splendid and very interesting churches in South Herefordshire. They ranged from the small 19th century Italianate basilica at Hoarwithy to the large 13th century Cistercian monastery at Abbey Dore, with a two-course lunch at The Kilpeck Inn. It is thirty years since the Duchy of Cornwall bought Highgrove in Gloucestershire. Originally styled ‘High Grove’ the house was built between 1796 and 1798 to a Georgian neo-classical design. When HRH The Prince of Wales first arrived, Highgrove possessed little more than a neglected walled garden, an overgrown copse, some pastureland, and a few hollow oaks. Today, after the hard work of scores of people, the garden unfolds in a series of personal and inspiring tableaux, each one reflecting the Prince’s interests and enthusiasms. When we visited, the roses were in full bloom. ‘Jude the Obscure’ scrambled over the Indian gate and the ‘Lady’s Mantle’ formed a carpet of pale yellow tufts on the terrace at Highgrove. In the kitchen garden the central borders were at their best and we gazed in admiration at the clumps of seven feet tall purple, blue and white delphiniums, holding their heads high above the blue iris, salvias and geraniums. The summer had seen the wild meadow turn brown and overgrown, but we were delighted to see the Moroccan-inspired fountain in the carpet garden. The Carpet garden (inspired by an original sketch based on a Turkish carpet) was developed and designed by Emma Clarke and taken to the Chelsea Flower Show this year – the first time a member of the Royal Family had a display at Chelsea. There were no photographs allowed, but we had lasting memories. 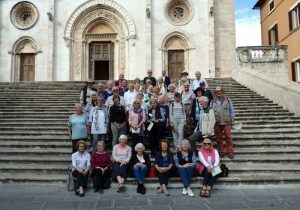 This year our UK tour provided its 29 participants with a wonderful variety of places of interest to visit, organised by Yvonne O’Hara through Tailored Travel, and led by Jean Vaudeau. Our first stop on the journey down was to the SS Great Britain in Bristol, where we were able to learn about its history before exploring the three decks of the ship itself. It was interesting to compare the comfortable accommodation and smart dining saloon of the first class passengers with conditions in the steerage for the less affluent! The cargo deck and forward hold illustrated the supplies stored on ship for its long voyages, including the many animals kept on board, such as sheep, a cow, horses, poultry etc. After lunch we continued on to Exeter to the comfortable Mercure hotel, our base for four nights. Our Blue Badge guide joined us to lead a morning tour of Exeter town centre which was combined with a guided tour of the Cathedral, both of which were very interesting and gave members an appetite for returning to see more. Later we visited the fascinating Powderham Castle, still privately owned by the Courtenay Family and home to the 18th Earl of Devon. The building was originally medieval but with 18th C and Victorian extensions and had many remarkable features, including several secret doors, a sliding mirror to cover a window and magnificent staircase to number but a few. Saturday afforded us a day of contrasts as we visited the informal and welcoming home of the liberal Ackland Family who gave their 18th C home, Killerton, to the National Trust for all to enjoy. Set in lovely parkland with a garden designed by Veitch, an ice house sited in the rockery, and a bear house with its knuckle-bone floor and stained glass window, the house has been refurnished to replace that taken to Exeter during the last war and unfortunately destroyed. Visitors were encouraged to play the piano or organ, read books in the library and inspect the costume exhibition upstairs. We all felt very much at home! Knightshayes Court, where the Heathcote Amory family decided to build a grand house worthy of a Conservative MP, was a very different experience. They initially engaged the eccentric architect William Burges but became disenchanted with all his rather florid designs and replaced him with another architect, John Crace, to tone them down. We are left with a rather grand Victorian country house with rich interiors, set in a celebrated garden and parkland. The highlight of the tour for many was the visit to Coleton Fishacre. After travelling through rain, our party was greeted with sunshine as we reached the breath-taking gardens and house owned by the D’Oyly Carte family. The Arts and Craft-styled house had elegant Art-Deco-influenced interiors, which were beautifully light and attractive with great attention to detail. There were many personal touches and we had the opportunity to handle artefacts and fabrics. Outside, a beautiful garden full of exotic plants led down by the side of a rill and stream to the sea! We could have spent the whole day there! Instead we were taken on a rather rackety vintage 1950’s bus to Greenway, the holiday home of Agatha Christie, by a most amusing but informative driver! The house was in a similar setting with extensive gardens leading down to the sea and views over the Dart Estuary; its rooms were full of items collected by the family, including a charming portrait of the young Agatha holding a doll which had later been found and placed on a chair beneath the picture. The shop was well-stocked with copies of all her books! We said our good byes to our excellent Blue Badge guide, and left the hotel the following morning. We had a journey full of frustrating diversions and frighteningly narrow roads on the way to our last National Trust House, Barrington Court, in Somerset. This was the first house acquired by the National Trust in 1907. Originally owned by the Strode family until 1745, it was then poorly maintained and became derelict after a fire in the early 19th century. Fortunately, Colonel Lyle of Tate and Lyle fame, leased it to house his extensive collection of wooden panelling, including a magnificent staircase and impressive Long Gallery. The rooms are now empty of furniture so that one can appreciate the grand proportions. The design of the very attractive gardens was inspired by Gertrude Jekyll; they include a large kitchen garden and separate rose, lily and white gardens. The tour went without a hitch and was greatly enjoyed by all. Johnson’s provided a superb driver, Simon, whom we will ask for again. We all enjoyed each other’s company and look forward to the next extended tour. Following the April lecture on Viking Art and Pottery, we visited The Vikings: Life and Legacy exhibition at the British Museum on 4 May, 2014. This exhibition aimed to reveal the true nature of the Vikings and displayed a range of newly-discovered jewels, weapons and armour as well as a magnificent 1,000 year old, 121 foot warship, the star of the show! Stradfas members also had time to visit other areas of the British Museum before we moved on to the Wallace Collection in Manchester Square. This provided an interesting contrast; the vastness of the British Museum against the intimacy of the Wallace Collection, which was new to many of those on the outing. It is best known for its paintings by artists such as Rembrandt, Titian, Hals, Reubens, Gainsborough, Turner and Canaletto but there is also a magnificent collection of porcelain, furniture and arms and armour. STRADFAS members visited Waddesdon Manor in Buckinghamshire, a beautiful National Trust property built by Baron Rothschild in 1874. Our coach arrived in good time for a delicious Christmas lunch of turkey and plum pudding, and fortified with good wine and food, we made our way into the Manor. The East and the Bachelors’ Wings were decorated with a wide variety of foliage, with the scent of the fir trees and bauble-laden wreathes evoking memories of Christmas past. An Alpine theme predominated as the original owner of Waddesdon, Baron Ferdinand de Rothschild was born in Austria. The eighteen Christmas trees that decorated the Manor gardens stood over 20 feet high each, and every one was trimmed to a perfect conical shape. They were a dazzling sight, lavishly decorated with thousands of Swarovski crystals. The lovely weather meant that our members could stroll around the beautiful grounds and follow the trail of light installed by the British light artist Bruce Munro, who specialises in outdoor installations. As the daylight faded, one of the most enchanting sights was a wavy river of 6,500 tiny bulbs on stalks, changing colour and rippling through the crocus slopes. The little bulbs glowed in the dark and lit up the whole valley to create the most beautiful effect. Because of the long journey, we had a welcome coffee stop on the M6 toll road, arriving at the Liverpool Tate shortly before noon. Those of us who don’t know Liverpool were impressed with Albert Dock, of which the gallery forms a part. The old industrial and commercial dockside buildings have been transformed into attractive restaurants and shops as well as the Tate gallery. On arrival, we were shown into the Tate Auditorium where John, an exhibition guide, gave us a most interesting and sometimes amusing talk on Marc Chagall’s life and work. John explained how Chagall had been influenced by a number of his contemporaries, especially when he moved to live in Paris but retained frequent references in his art to his Jewish upbringing and his home in Vitebsk in Russia. John drew our attention to particular features in the paintings that we might otherwise have missed and told the stories behind them. He held our attention for almost an hour and several of our members remarked that he really “made our day”. The Chagall exhibition itself was magnificent, the largest showing of his work for 15 years. His use of colour is particularly striking and can only be appreciated by seeing the actual paintings. Even those who had been somewhat ambivalent about Chagall’s work felt more enthusiastic about it as a result. When we had visited the exhibition we were free to look at other exhibits in the Tate or visit the various museums around Albert Dock, including the Merseyside Maritime Museum, the International Slavery Museum and even the Beatles Story! After stopping for excellent coffee and cakes at The Bluebell Inn, the visit began with a visit to Tissington Hall, built in 1609 by the FitzHerbert family and still lived in by their descendants. The tour included the 10 acre gardens as well as the house, which contains many interesting paintings, furniture and artefacts but still has the feel of a family home. Next we were able to wander round the village of Tissington where the annual well dressing festival runs for 7 days from Ascension Day each year. There were 6 wells reflecting varied themes such as the Dambusters, the Crucifixion, The Good Samaritan and even Peter Rabbit! The coach then took us to the imposing Neo-classical Keddleston Hall, built on a grand scale for entertaining. It is a good example of the work of Robert Adam who designed the interiors and the parkland, for the Curzon family, who still live there. Our group of 37 members arrived in a rain-drenched Bologna, but the sun shone for the rest of our visit! Anna and Paula, our tour guides took us on a walking tour of the main palaces and churches of the city where we all appreciated the shade of the porticoed streets. After taking many photographs of the two towers, the oldest university in Europe including the famous Teatro Anatomico and the two cathedrals, we were free to enjoy the first of many ice–creams. Our welcome dinner at a local restaurant included a pasta course with Bolognese sauce (a mixture of veal and pork not beef). Next morning, our guides escorted us to the Pinacoteca Nazionale, a very impressive art gallery, home to early religious works of Bolognese artists as well as paintings by Giotto, Raphael and Perugino. Some brave people took taxis to the Santuario di Madonna di San Luca, an 18th century shrine a few miles outside the city and walked back down through the world’s longest portico with 666 arches – a distance of between 5 and 8 kilometres according to whom one consulted. Our third day was spent in Ravenna, once the capital of the Roman Western Empire. The 5th and 6th century Byzantine churches were truly amazing for their construction and the wonderful mosaic domes and walls they housed. 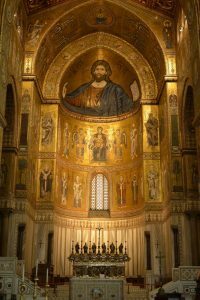 Endless photographs were taken of the stunning green, gold and blue mosaics in the churches of Sant’ Apollinare Nuovo, San Vitale, Sant’ Apollinare in Classe, the Mausoleum of Galla Pacidia and the Neonian Baptistry. Our next three days were spent in an area which had been affected by the earthquake of May 2012 and, sadly, several of the key palaces containing famous art treasures were closed for restoration. In Ferrara, once the seat of power of the famous d’Este family, we spent time examining the Cycle of the Months fresco by Francesco Della Cossa and Ercole de’Roberti in the magnificent Palazzo Schifonoia. After a break for lunch (a must in all Italian tours), we were guided through the medieval streets of the walled town. Mantova was our furthest destination from Bologna but was well worth the journey as we saw on our arrival its domes and towers rising from the lakes which encircle it. The city was ruled by the powerful Gonzaga family for three centuries who made it a rich cultural centre. Although we were unable to visit the interior of the Palazzo Ducale, we did view the formal gardens and later in the afternoon visited the Palazzo Te with its astonishing frescoes in the “Room of Giants” by Guilio Romano. Our busy day was concluded with a farewell dinner for the whole group at a local Bolognese restaurant where an impressive amount of food was presented and consumed in a most convivial atmosphere. Our final day was spent in Modena, the birthplace of the tenor, Luciano Pavorotti. With the help of local guides, we were introduced to the Duomo, a very fine Romanesque building, dating back to the 11th century which is on the UNESCO World Heritage list and which contains the stone coffin of St Geminianus, the patron saint of Modena. Later Anna, our guide, took us to visit some friends who run an aceterie, producing balsamic vinegar. We tasted vinegar of various ages up to 25 years old and could purchase vinegar up to 40 years old – we even discovered that a few drops of balsamic vinegar can enhance the flavour of ice–cream! We finally reached home in the early hours of Sunday morning – physically tired but still savouring all that mouth-watering Bolognese food, and mentally refreshed by our wonderful Italian tour.